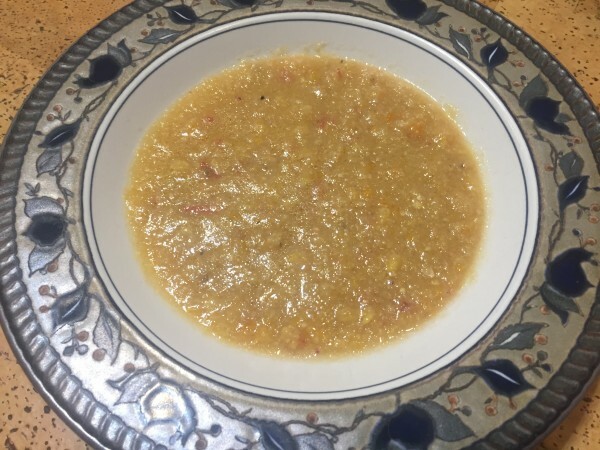 One of my favorite ways to cook through a big mix of root veggies is a mixed vegetable pureed soup. You can make this with pretty much any combination of vegetables you desire — the one thing I try to do is balance earthy with sweet — too many sweet roots will lack complexity, too many earthy notes can make it heavy and sometimes even sulfury. Generally speaking, if you keep your ratio 1:1 of cups of chopped veggies to cups of liquid (not counting aromatic add ins like onion, garlic…) you should have a good consistency for your soup. Don’t spend too much time dicing everything up all neat and pretty — yes, smaller chunks will cook faster, but the whole thing is getting pureed at the end, so don’t worry the details too much. 8 cups Chicken or Vegetable Stock, use homemade if you have it! 1-2 tablespoons Fresh Herbs, minced for garnish — or choose another garnish – scallions, croutons etc. Melt the butter in a large soup pot over moderately high heat. When foaming subsides, add onions with a pinch of salt and sauté until the onion is tender and translucent, about 7 minutes. Stir in the garlic for 60 seconds then pour in the stock. Add in all the chopped vegetables, and bring to a boil, skimming any foam that rises. Stir in the bay leaves and rosemary sprigs. Simmer soup until all the vegetables are tender, about 20-25 minutes. Remove the bay leaves and rosemary and discard. Puree the soup in a blender in batches (carefully — hot soup can splash up explosively), or with an immersion blender, until smooth. Use your discretion about how smooth you want it — feel free to leave some texture, or if you want it silky smooth, pass it through colander after pureeing. Rinse out your cooking pot, then return your soup to it and heat it stovetop until warmed through. Stir in the lemon juice. Taste, and adjust seasoning with salt and pepper. Serve hot with garnishes of choice. I love to find cooking classes that help address my cooking weaknesses and to further my skill set. In March, I took a class at Orange Tree Imports by Jeff Doyle-Horney “The Pie Guy” for Gates & Brovi and the winner of many a bake-off and state fair. His recipe for pie dough is the most forgiving and workable dough recipe I’ve ever used! And his version of Joan Nathan’s (NYT) Cornish pasty is exactly the 2nd time ever in my life that I enjoyed rutabaga! I even willingly bought one to make this dish at home for my family — I NEVER EVER before willingly purchased a rutabaga — I only ever work with them when they arrive in my CSA — they and turnips are my least favorite veggies. 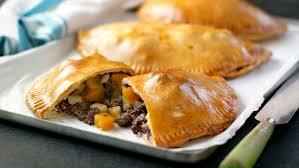 But not here — here their earthiness is the perfect note/foil to fat in the ground beef filling. This recipe is a real keeper. If you are making your pie dough from scratch, add at least 45 minutes to the prep time to combine your dough and allow it to rest for a half hour. Preheat oven to 425˚. Divide each pie dough in half. Roll each piece until flattened in as close to a circle as you can get. In a mixing bowl, combine potatoes, beef, onions, rutabaga, onion powder and season it with salt and pepper. Divide the mixture across the 6 pieces of dough. Moisten the edges of the dough, and fold the dough over to cover/capture the filling. Crimp the edges with a fork. Place on a greased baking sheet. Cut several small slashes in the top of each pasty. Bake at 425˚ for 30 minutes, then drop the temperature of oven to 350˚, and bake for another 1/2 hour until nicely browned. Can be served hot, room temperature or cold. Madison’s “The Pie Guy” Jeff Doyle-Horney has won State Fairs, and other baking competitions with his pies — in large part because of his mastery of pie dough.This is his recipe — it is the most pliant easy to work with dough I’ve ever handled. Process flour, salt and sugar in food processor until combined, about 2 one-second pulses. Add butter and lard and process until the largest clumps of fat are the size of small peas, about 8 two-second pulses. Empty mixture into large bowl.Sprinkle vodka and water over mixture. With rubber spatula, use folding motion to mix, pressing down on dough until dough is slightly tacky and sticks together. With hands, divide dough into 8 even balls and flatten each into 4-inch disk. Wrap each in plastic wrap and refrigerate at least 30 minutes, or up to 3 days. You can freeze well-wrapped dough up to a month. 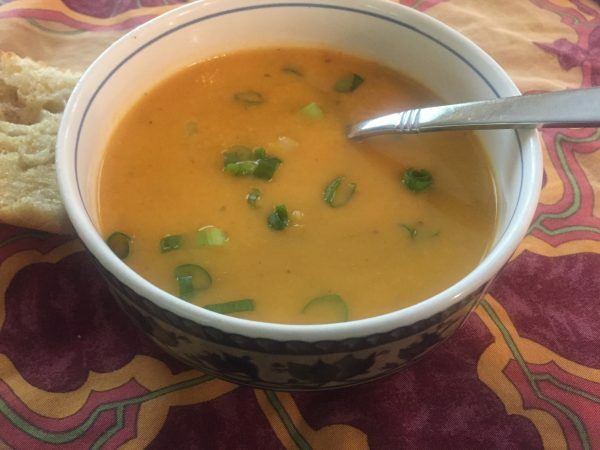 One of my favorite recipes from the Asparagus to Zucchini cookbook was contributed by a middle-school aged girl, and features the delightful balance of sweet, salty, sour, and hot that is the highlight of Southeast Asian cuisine. Her original recipe calls for chicken and a different set of vegetables, but the sauce and noodles are endlessly adaptable to the vegetables you may have in hand. 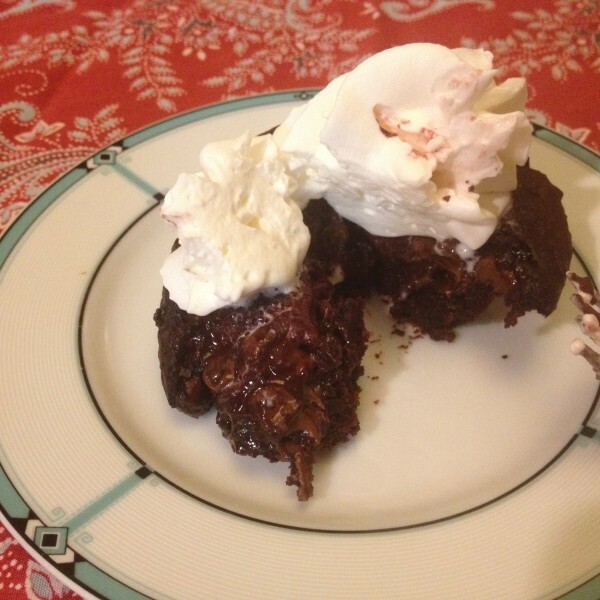 This is one of MANY variations I have made of this delicious recipe. Use a food processor to shred the vegetables to make for a quicker prep time. Prepare glass noodles according to package instructions. Bring water to boil, then dissolve sugar in it off heat. Allow to cool to about room temperature. Stir in sweet chili sauce, lime juice and fish sauce. 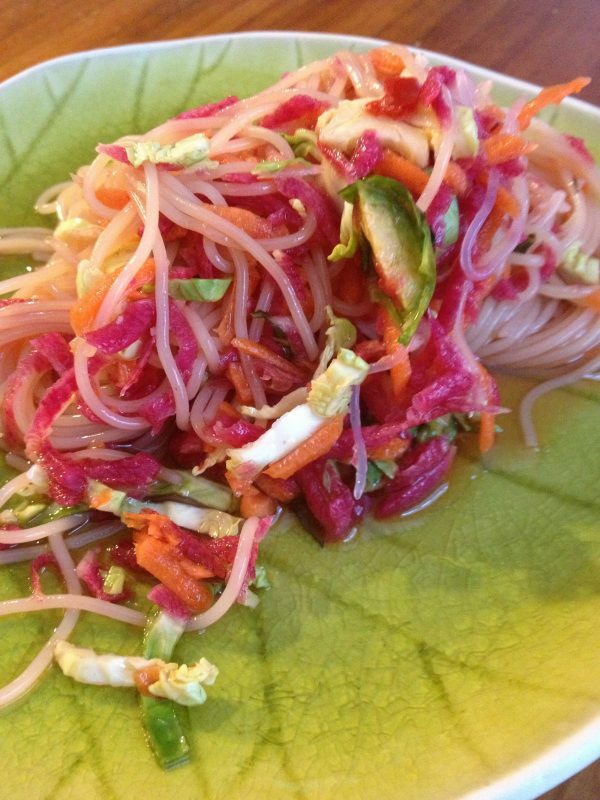 Toss with noodles, veggies, herbs and nuts. Serve room temperature or cold. When I lived on the Upper West Side of Manhattan, one of my favorite dives was “La Caridad” on Broadway at 78th, which described itself as a “Chino-Latino” restaurant. But this was no fusion. The staff was all ethnically Chinese men who had immigrated to the US from Cuba. Half the menu was Chinese, half Cuban. In its heyday, it was always bustling, and it was inexpensive with huge portions. I always ordered from the Cuban side of the menu — often the Bisteak Palomilla with Yellow Rice and Black Beans. This is my approximation of a solid Yellow Rice with Black Beans. They used Goya Sazon, which is an umami bomb full of MSG, but I make annato oil instead to get good flavor and the great orange-y “yellow” color. FYI — if you’re going to NY, this isn’t an endorsement of the current La Caridad. I hear it went downhill…..If you would rather cook with brown rice, the color won’t be quite as vibrant, and you will need to cook it 45 minutes, not 15. This is a classic “kitchen sink” recipe — you can toss in all manner of veggies: poblanos, fennel, celery/celeriac, corn etc etc. Use up whatever you have on hand! If using annato seed, place in 1 tablespoon oil in a small saucepan and heat until the oil shimmers. Remove from heat and allow the seeds to steep for about 10 minutes. Using a slotted spoon, discard the seeds and continue with step 2. If using annato paste, heat oil in a small saucepan and add the paste, stirring to fry it and incorporate it into the oil. Add half the onion with a good pinch of salt into the annato oil and sauté until the liquid comes out of the veggies and then evaporates. Add half the garlic and sauté for 30 seconds. Add rice to pan, and stir to coat all the grains in the oil. Add the stock and bring to a boil. Cover and reduce heat to low. Cook until rice is tender, about 15 minutes. While the rice is cooking, heat remaining oil in a large skillet over high heat. Add remaining onion, the peppers, and the summer squash and a good pinch of salt and pepper. 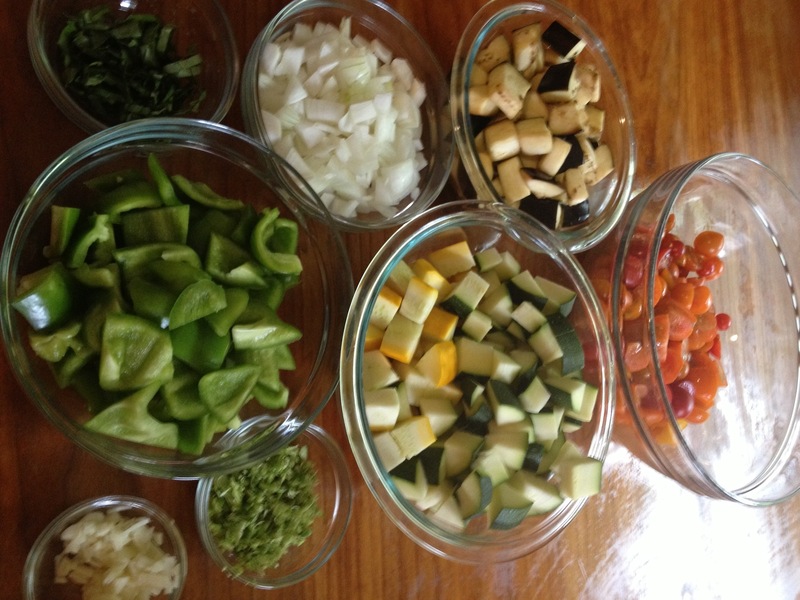 Sauté until the liquid releases from the vegetables and evaporates. Then pour in the black beans and their juices along with the diced tomatoes and spices. Stir to combine, then simmer about 5-7 minutes, until tomatoes are softened. Taste and adjust seasonings. Serve beans hot over rice. One hot night, I decided to make a cold soup using cucumbers and corn. Then I realized that I also had some ripe yellow heirloom and cherry tomatoes, and Golden Gazpacho was born! 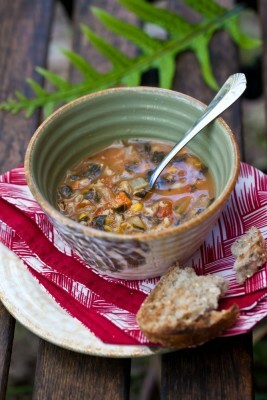 Sweet, a definite corn note lingering after the more traditional gazpacho flavors. This was a refreshing element of a meal on a hot night. Bring a pot of water to a boil, then cook the corn until tender, about 6-8 minutes. Run corn under cool water until it is cool enough to handle, then remove kernels from the ears. Puree all the veggies, vinegar and oil in a blender in batches, transferring pureed soup to a serving bowl. 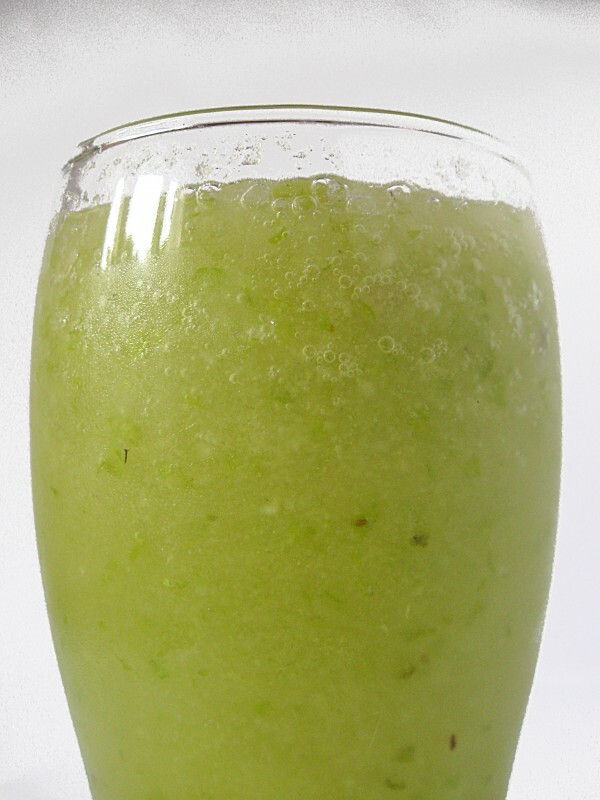 You can puree it until super smooth or leave it a little chunky based on your taste. Season to taste, refrigerate until cold and serve. A high school friend cooked this for me some 30-odd years ago as an introduction to her family’s culture and food. I had never tasted anything like it before, and I still remember the very specific smells and sensations of that night. The chili pepper was a shock to my uninitiated palette, but I was completely in love with the flavors and textures. 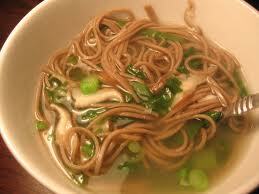 It has remained a favorite dish for me. Serve with basmati rice or nan. If you don’t enjoy spicy food, add a teeny bit of chile and taste — you can always add more, but you can’t take it out! Heat the oil in a large heavy skillet (that has a lid) over high heat. Sauté the onions with a pinch of salt until softened and starting to color a bit. Add in the ginger, garlic, chiles and potatoes and sauté until fragrant, about 1 minute. Add the tomatoes and water and sauté until tomatoes begin to lose their shape. 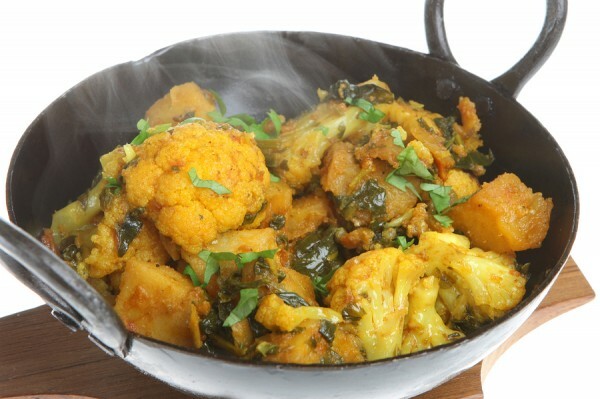 Stir in the cauliflower, garam masala and turmeric, and season with another pinch of salt. Cover, reduce heat to medium/ moderately low, and cook for about 15-20 minutes, stirring occasionally. Sprinkle in cilantro, adjust seasonings and serve hot with basmati rice, or takeout Indian bread of choice. 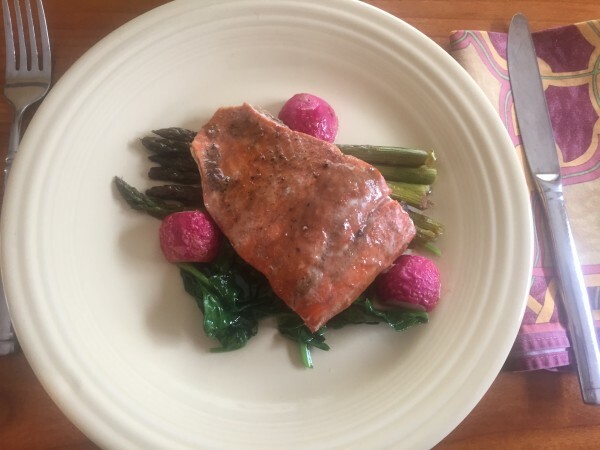 This delicious balsamic honey glazed meal highlights the flavor of the radishes — so sweet and mellow this time of year, and it is a whole new way to love asparagus. If you can’t find trout fillets at the market, substitute salmon or other thin filleted fish, or try the vegetarian version of this recipe with tofu. The 40 minute prep time includes 30 minutes of unattended marinating time. The recipe scales up or down well. Preheat oven to 425ºF. In a small bowl, whisk together honey, vinegar, mustard and salt until well blended. Spread about 3 tablespoons of honey mixture onto the flesh side of trout fillets and allow them to marinate at room temperature for about 30 minutes. Stir melted butter into remaining honey mixture. Place radishes and asparagus in a large rimmed roasting pan lined with aluminum foil or parchment paper; toss vegetables with honey mixture. Roast for 5 minutes. Push veggies to the side to make room for the fish. Add trout, skin side down, to the roasting pan. Spoon any sauce from the pan over the trout. Roast for about 10 minutes, until fish flakes easily when tested with a fork. Meanwhile, heat the oil in a skillet over high heat. Wilt radish greens in hot oil, about 2 minutes. Season to taste with salt and pepper. Divide greens among 4 plates and serve fish and veggies over the greens. We think it is high time to make a pot of chili! We’ve added a little cinnamon and unsweetened chocolate to “mole-nize” this, and we hope you enjoy it this way–it gives the chili a richer, warm note. I highly recommend you freeze this if you can. One of those busy evenings in the colder months you’ll be thankful for this easily reheated dinner. Enjoy with cornbread, rice, or tortillas to round it out, or just by itself for lunch. Preheat a large, heavy pot over high heat. Add 1 tablespoon olive oil and heat until it shimmers. Generously season beef with salt and pepper, and working in batches, brown the beef on all sides. Remove browned meat to a bowl and reserve. Add remaining oil to same pot over moderately high heat. Add the onion, carrot and pepper. Sauté until the veggies are almost tender, about 6 minutes, scraping up any browned bit in bottom of pan . Add the garlic, chipotle, chili powder, cumin, coriander, and cinnamon, and stir, scraping the bottom of the pot so the spices are gently toasted, but not scorched, for 1-2 minutes. Add the cider vinegar, tomatoes with their juice, and stock. Bring to a boil and skim off any foam that rises to the top. Stir the beef back into this. Stir in the grated chocolate. Reduce heat to medium, cover and simmer until meat begins to become tender, about an hour. Stir in squash and occasionally stir gently, allowing the liquid to reduce some until squash is tender, about 15-20 minutes. Stir in the drained beans, and cook for another 5 minutes to warm. Taste, and add salt and pepper as desired. The wine concept of “terroir,” the way in which the land, soil, climate etc. influences the flavor of a wine, is also useful in thinking about wine and food pairings, and what wines to use in cooking certain foods. 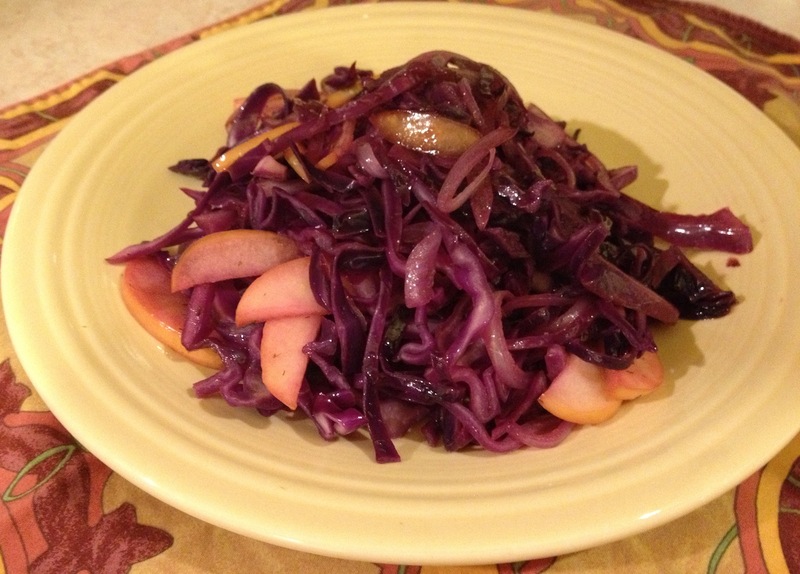 My paternal grandmother was Alsatian, and made delicious braised red cabbage dishes. In trying to play with some of the flavor profile of this classic Alsatian dish, I thought about terroir and turned to a classic Alsatian wine — Riesling. Deglazing the pan and simmering the veggies with a well balanced sweet-acidic Riesling brought out the crisply fruity flavors that lurk in the cabbage and beckoned for the addition of some apples to the dish. Delicious! Heat the oil in a large skillet over medium high heat, when the oil shimmers, add onions with some salt and pepper. Sauté until onion is translucent, about 5-6 minutes. Stir in cabbage and dill, sauté until cabbage begins to wilt a little. Pour in the riesling, and bring to a boil, stirring occasionally. Cook until cabbage is crisp/tender to your liking. Stir in the apples and cook about 2 minutes, until tender but not breaking apart. Taste and adjust seasoning. Serve hot. 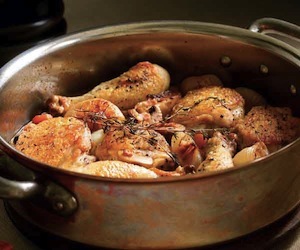 A hearty and warming braise, just right for the chilly temperatures outside. Buy a loaf of crunchy bread for soaking up the juices. Heat 1 tablespoon of oil in a sturdy dutch oven. Pat chicken parts dry and sprinkle generously with salt and pepper. Working in batches so as not to crowd the pan, sear each piece of chicken until skin is nicely browned. Remove chicken to a plate while you proceed to brown remaining chicken. Add remaining tablespoon to pot and sauté onion with a sprinkle of salt and pepper until wilted, about 6 minutes. Add in flour or potato starch and stir to absorb oil. Deglaze pot with white wine, scraping up any browned tidbits in bottom of pan. Boil wine until smell of alcohol cooks off, about 3 minutes. Stir in squash, carrots, sage, thyme and chicken stock. Nestle pieces of chicken, skin side up, among the squash mixture. Bring to a boil, then reduce to a simmer, cover and cook until chicken reaches an internal temperature of 165˚ and squash is tender, about 25 minutes. Stir in spinach and simmer until wilted, taste and adjust seasonings. Start your chutney well in advance of making the wraps so that it can be chilled. Sauté onion in oil in a saucepan until tender. Combine all ingredients from sugar through ground clove in the saucepan. Bring to a boil, then simmer for 20-25 minutes. Cool to room temperature, then store in refrigerator until ready to make sandwiches. Clear a large enough work space to spread out each of the 8 tortillas. Using a small offset spatula, spread a little bit of cream cheese on edge of tortilla farthest from you. This will act as “glue” to hold the wraps closed. Divide the chutney across the 8 tortillas and spread over the whole tortilla leaving a 1/2 inch border before the cream cheese. Lay 5 slices of turkey in a line in the middle of the tortilla. Top with a handful of spinach leaves and red onion. 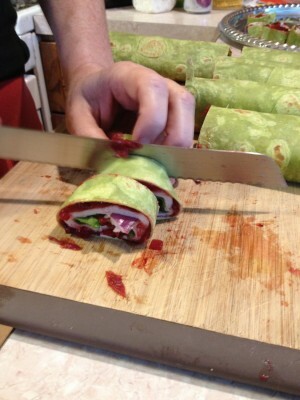 Tightly roll the tortilla and seal the edge with the cream cheese. Slice off the two ends to make an even edge, then slice the tortilla into 6-8 even bite sized pieces. Arrange decoratively on a serving platter. When you are in the mood for a good gratin, nothing beats gruyere’s depth of flavor. The cauliflower and gruyere combined have a terrific nutty flavor. Preheat oven to 375˚. Steam the cauliflower until crisp-tender, about 4 minutes. If using wheat flour, meanwhile, melt 2 tablespoons butter in a small saucepan, whisk the flour into the butter and stir to form a roux. Whisk the milk into the roux, then cook, stirring occasionally, until sauce comes to the boil, lower heat and simmer for about 5 minutes until milk is thickened. Stir in dry mustard, salt and pepper. Remove from heat. Stir in gruyere cheese. In a separate sauté pan, melt remaining tablespoon butter, and toast breadcrumbs until lightly browned. Remove from heat, stir in parmesan cheese. 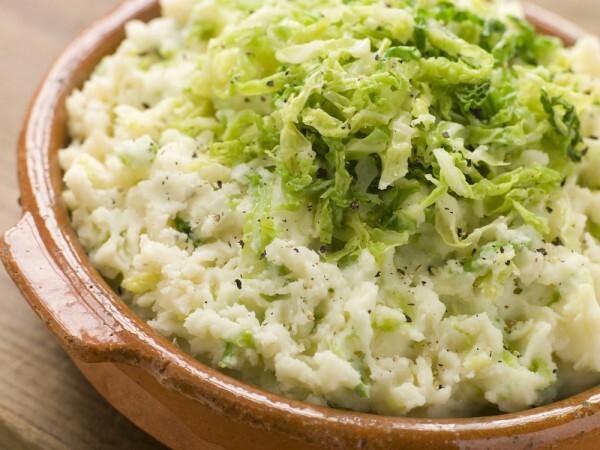 Spread cooked cauliflower in a 2 quart baking dish, pour sauce over, sprinkle with toasted breadcrumbs. Bake for 30 minutes, until bubbling hot and browned. A richly satisfying salad meal, this one can be made up to a day ahead of time. Shred celeriac with the shredding disk in a food processor, or with a box grater. Toss with lemon juice to keep celeriac from discoloring. Set aside. In a small bowl, mix together mayo, sour cream, spicy mustard, vinegar, honey and chives. Toss the kale and celeriac with the dressing. Taste and adjust seasonings. 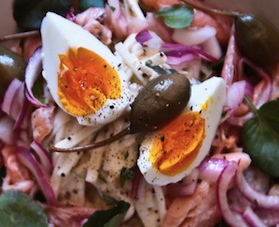 Divide this mixture among 4 plates, top each salad with a quarter of the trout, eggs, and caper berries. Give an extra crack of pepper to the top, and serve. 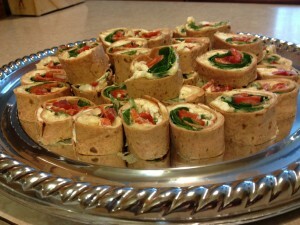 If not serving immediately, wrap tightly with plastic wrap and keep in refrigerator. A classic dish — ratatouille — that uses an abundance of mid-late summer vegetables in a tasty stewed melange. You can eat it as is, or serve over polenta, rice, pasta. 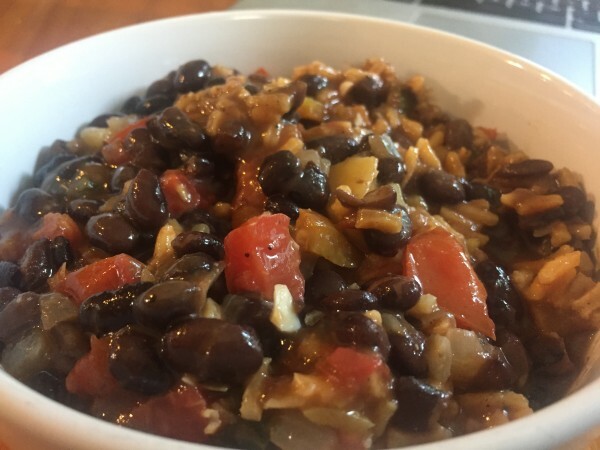 Thanks to the Pixar movie of the same name, my kids BEG me to make this dish as soon as the first eggplants and peppers arrive in our CSA share. Put the cubed eggplant in a colander and sprinkle with kosher salt. Toss well and set aside to drain. After about 20-30 minutes, rinse off eggplant, pat dry. Heat the olive oil over medium – high heat in large skillet or wok. Add the eggplant and cook, stirring occasionally, until lightly browned. Add in the red pepper, onion, and garlic. Cover and cook over medium heat, stirring occasionally, until the vegetables are soft, about 25 minutes. Stir in the zucchini, tomatoes, herbs and sauce, cover, and cook until just tender, about 10-20 minutes. Season to taste with salt and pepper, and serve. 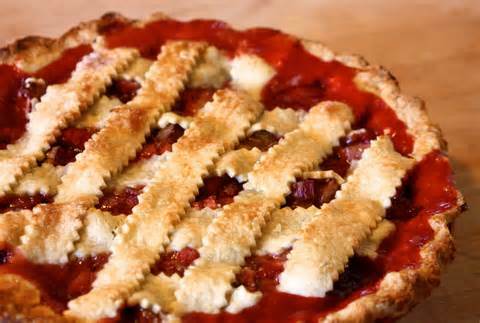 June 9 is Strawberry Rhubarb Pie day — so here we give you a classic early summer delight. Preheat oven to 400°. Combine the filling ingredients (not egg) in a large mixing bowl. Roll out 1 dough disk on floured work surface to be about a 13-inch round. Transfer to a 9-inch glass pie dish. Trim the excess dough, leaving 3/4-inch overhang. Roll out the second dough disk on lightly floured surface to a 13-inch round. Cut this round into fourteen 1/2-inch-wide strips. Spoon the filling into crust. Arrange 7 dough strips atop filling, spacing evenly. Form lattice by placing remaining dough strips in opposite direction atop filling. Trim ends of dough strips even with overhang of bottom crust. Fold strip ends and overhang under, pressing to seal. Crimp edges decoratively. Brush egg/ water glaze over crust. transfer pie to baking sheet. Bake 20 minutes. Reduce oven temperature to 350°F. Bake pie until golden and filling thickens, about 1 hour 25 minutes. Transfer pie to rack and cool completely. Holiday weekend is upon us, along with neighborhood potlucks, backyard barbecues, camping trips and lots of opportunities to grill a burger or brat. Here is a tasty and classic potato salad to share at your parties, and I’ll tell you a secret about potato salad — its pretty much about the dressing. The actual veggies you use are very flex — play with it based on what you have on hand. No scallions? Try a little sliced spring onion tops or diced red onion. Have some radishes or celery handy and want to add a little crunch? Dice ’em up and toss them in. Have a handful of parsley lying around — mince it right in there. I tend to like my potato salad a little more vegetable-y and a little less dressing-y. If you want more dressing, add 2-4 tablespoons mayo to the salad and enjoy! The majority of the prep time is unattended cooling time for the salad. Bring a salted pot of water to the boil. Cook potatoes until JUST tender and easily pierced with the tines of a fork — 15 minutes or so. Drain. Be certain to test the veggies as they cook. You don’t want overcooked mushy veggies in your salad. Combine potatoes and vinegar while still hot. Allow veggies to cool almost to room temperature. Whisk together mayo, mustard, scallion or spring onion tops, relish, and paprika. Stir dressing into veggies and refrigerate until cold. Just prior to serving, fold in chopped hard boiled eggs and parsley. 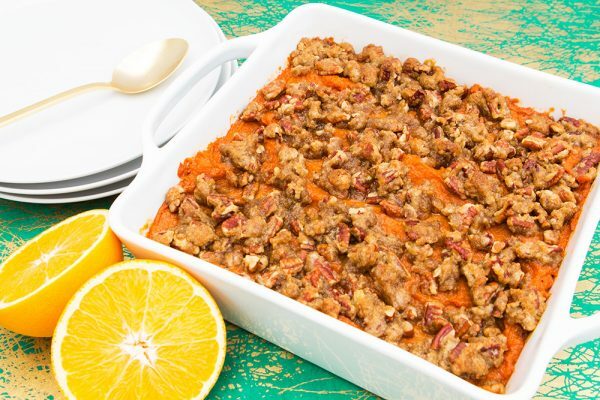 Delicious weekend brunch addition or a tasty dessert — you decide! Preheat oven to 375˚. Place apples in a baking dish. Combine granola, cinnamon, craisins and honey and fill the cored apple with the mixture. Pour about 1/4 inch of water into the baking dish and bake for 40 minutes. Our family has spent a lot of time searching out the best taco stands in San Diego on our year long sabbatical. Most of the really good ones have condiment bars that go way above and beyond a few salsas and some wedges of lime. One of my favorite finds on the condiment bar at lots of the taco shops is a spicy pickled onion and carrot topping that adds heat, sweet, sour and zip to everything from carnitas to carne asada or fish tacos. Here is a variation of this great topping. You want a mix of veggies totaling 1.5 pounds. Toast the cumin seeds in a dry skillet until fragrant. In a non-reactive pot, combine water, vinegar, oregano, salt and peppercorns. Bring to a boil, stirring to dissolve the salt. Remove from heat and stir in onions, garlic, jalapeño and cumin seeds. Bring a separate pot of water to a boil, and season the water generously with salt. Boil the carrots until crisp tender, about 2-3 minutes. Drain the carrots, then stir into the vinegar mixture along with the remaining veggies. Allow the flavors to marry for at least 1 hour before serving. This will keep for a few months in your fridge, or use a hot bath canning method to put up the pickles longer. 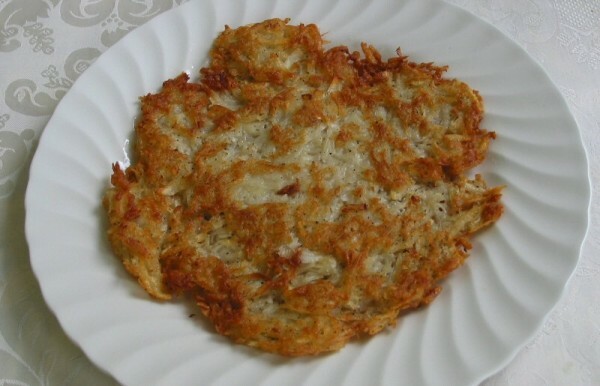 The crisp perfection that is a latke requires serious reduction in the amount of liquid present in the potato. To achieve dry strands of potatoes, I salt the raw shreds, place them in cheesecloth, and squeeze the heck out of them. If I’m feeling ambitiously purist, I will catch the liquid in a bowl, and wait a bit for the water to separate from the natural potato starch, drain off the liquid and use the starch as a binder in the latkes. But I’m rarely that ambitious or pure. Flour, store bought potato starch and matzo meal all work equally well here. If you don’t have onions — use scallions or chives. Serve this with apple sauce or sour cream or both! Take your shreds of potato, and sprinkle them with some salt. Lay them on a nice big piece of cheesecloth and give the salt 10 minutes or so to extract some moisture. Then wrap up the potatoes in the cheesecloth and wring, wring, wring as much moisture as you can get out of those strands. The drier, the crispier! Toss the potatoes with the onion, flour and egg. Season with a scant teaspoon of salt and a crack or two of black pepper. Heat a cast iron skillet over medium high heat. Warm the oil and melt the butter. When the butter ceases to foam place little scoops of potato mixture into the pan, being careful not to crowd and flatten them with a spatula. Cook until crisp and browned on one side, about 2-3 minutes. You’ll see the edges start to turn brown, and know they are ready to flip. Flip over and cook other side another 2 or so minutes. Remove from pan and drain on towels and continue cooking until all mixture is used up. These can be kept warm in a low oven, or made ahead of time, and reheated in a 350˚ oven for about 8 minutes. 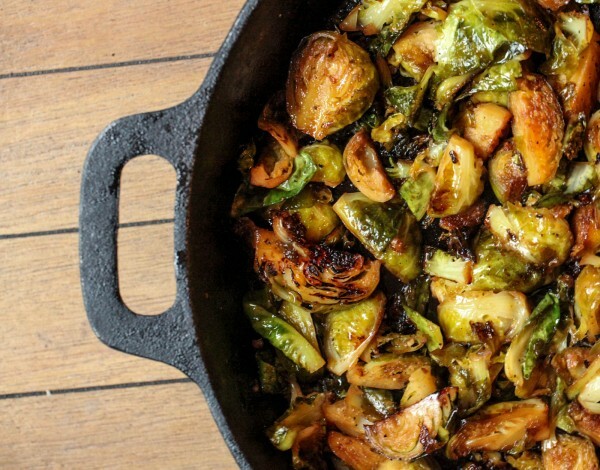 The sweet tart vinegar and cider sauce plays well with the cabbag-y-ness of the sprouts in this dish. Heat a heavy large skillet over high heat, and warm oil until shimmering. Sauté onions about 4 minutes, add sprouts, sauté 4 minutes. Add cinnamon and apple cider, bring to boil, cover, reduce heat, and simmer about 10 minutes, or until the sprouts are tender when pierced with a fork. Discard cinnamon stick. Remove veggies with slotted spooon. Boil to reduce liquid by half, add vinegar and reduce to glaze. Pour glaze over veggies and serve. I love a good tea sandwich, whether or not we are having a tea. I think they make great party food, and a wonderful snack or lunch. 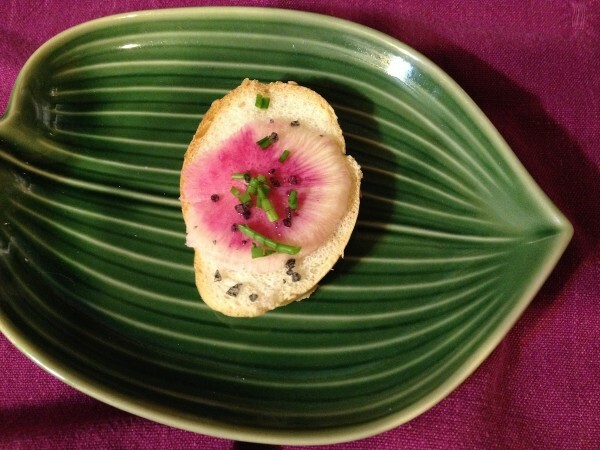 This Asian-ified take on the classic radish tea sandwich is uber-beautiful with the colorful beauty heart radish. Depending on how large your radish is, you may have to manipulate your cut to make it fit on the baguette. Most average sized beauty hearts are the perfect size for the average baguette slice. Peel your beauty heart radish. If you have a mandolin, set it to a very thin slice, and cut 32 paper thin slices of the radish, or using your sharpest chef’s knife, cut 32 slices. In a small bowl, combine butter, 1/2 the chives, 1/2 the sesame seeds and the ginger with the oil. Spread this mixture over the slices of baguette. Lay a slice of beauty heart on top (again, if the size isn’t right, be creative!) and sprinkle with remaining chives and sesame seeds. Just prior to serving, sprinkle a little touch of fleur de sel on top. Adapted from Bon Apetit April 2008. Schar makes a good Gluten Free Baguette. It’s amazing how something so simple can be so mouthwatering and satisfying when you use fresh ingredients and let them shine.Tomatoes do double duty here–the juices from the tomato create the sauce and then more ripe tomatoes are folded in. Easy and elegant. Bring a large pot of salted water to a boil. Cook the pasta according to package instructions. Reserve 1/2 cup of cooking water then strain the pasta. While your water comes to a boil, season the tomatoes with the salt and toss them well in a mixing bowl. Cut the basil into ribbons or roughly chop it. Take a pinch of this basil, chop it finely, and add it to the tomatoes to season the “tomato water” that the salt will extract from the tomatoes. Allow moisture to be extracted for about 5 minutes. Smash the garlic with the flat side of a knife, and chop it. Place it into a sauté pan. Pour the tomatoes into a strainer or colander over the garlic so that the tomato water will stream into the pan below. Set the strainer with the tomatoes back into the bowl so they don’t drip on the counter, and bring the sauce to a simmer. Add the butter while swirling or stirring the sauce. Keep the sauce moving until all the butter is melted. 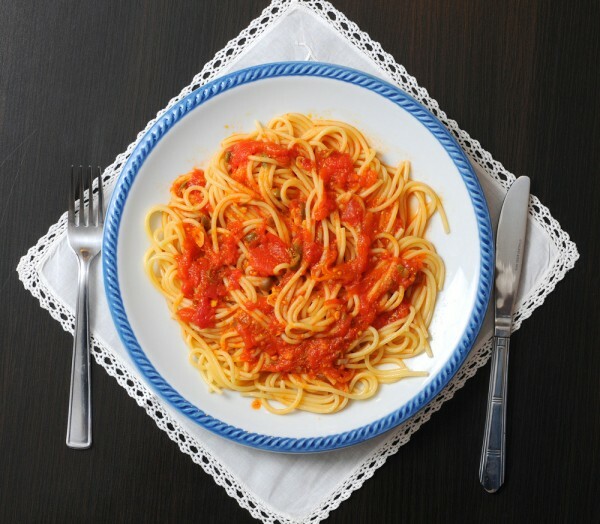 Add the tomatoes, any more tomato water that has accumulated, and the cooked pasta and toss to coat the pasta evenly. If you’d like a little more sauce, add some of the pasta water until you achieve your desired consistency. Divide the pasta among four bowls and top with the remaining basil. Recipe adapted from Michael Ruhlman. This classic French salad combines the flavors of the month of August — potatoes, beans, tomatoes, peppers with a lovely herbed vinaigrette and of course tuna, hard boiled eggs and olives. We use dained canned tuna here, but you may substitute grilled fresh tuna steaks for a splurge. My kids favorite part of this meal — I serve it as a “composed” salad — each individual item arranged on a platter (or many) so that everyone gets to take the items they most want. Place the eggs in a medium saucepan and cover with cold water. Bring water to a boil, then take off heat, cover and allow eggs to sit until hard cooked, 7 minutes. Drain, rinse with cold water, and place in refrigerator (or for a short time in the freezer) to cool. Cold eggs peel more easily. When you are ready to serve, peel and quarter the eggs. Simultaneously, heat a large pot of water with a steamer insert to a boil. Steam the beans for 4-5 minutes, until just tender. Remove from the steamer basket while keeping the water boiling, rinse the beans under cold water to stop them from cooking, and drain well. Next add potatoes to the steamer insert, cook until tender and easily pierced, about 15 minutes. In a medium bowl, whisk together the vinegar, shallot, mustard, mashed anchovies, dried oregano. Add the olive oil in a stream while whisking until emulsified. Season to taste with salt and pepper. 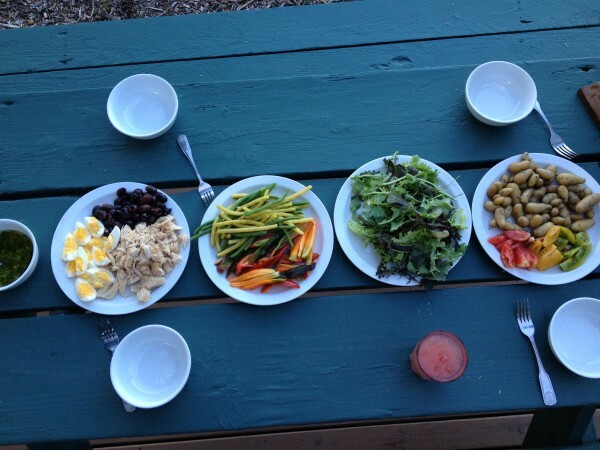 Arrange all the components of the salad on a large platter or several smaller ones: beans, potatoes, eggs, bell pepper, tomatoes, lettuce, tuna and olives. Sprinkle the parsley over, and, invite everyone to make a plate. Pass dressing to drizzle over each plate. 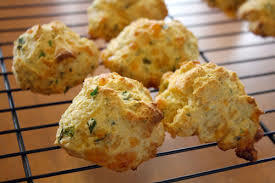 A basic buttermilk biscuit becomes exquisitely aromatic with the additions of scapes and cheddar. Preheat oven to 400˚. Mix dry ingredients together. Cut butter into tablespoons and, with fingers, blend into dry ingredients until mixture resembles cornmeal. Stir in cheese and scapes. Stir 1/2 cup buttermilk into beaten egg and add mixture to flour mixture. Stir quickly, adding more buttermilk as necessary until dough forms a ball. Turn onto floured surface and knead briefly. Let dough rest for a minute, then roll out to 3/4′ thickness. Cut into 2′ rounds. Place biscuits on baking sheet, 1″ apart. 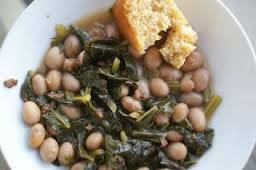 New Year’s Day is celebrated in many cultures with a bowl of black eyed peas and greens. This tradition dates back 1500 years to a traditional Rosh Hoshanah dish, and migrated with the Sephardic Jews to the American South. Grab some cornbread to sop up this stew — you will be living large, southern style, with this delicious meal! The beans do soak overnight, so start that the day before you want the stew. You can expedite the preparation time by using 2 14 ounce cans of beans if you prefer, in which case, you can reduce the initial simmering time to about 5 minutes. Soak the black eyed peas overnight in water. Drain and discard water. Heat olive oil in a soup pot over medium high heat. Add onion and garlic and sauté until wilted about 6 minutes. Add in diced meat or liquid smoke and stock, bring to a boil, reduce to a simmer and cook until beans are tender, about 45 minutes. Thoroughly clean and rough chop your greens. Stir greens into soup and simmer for about 20 minutes. Season soup with hot sauce, vinegar and salt and pepper to taste. After an unfortunate incident involving a borrowed car and a boulder, my husband and I were stranded in Ensenada, Mexico for a long, hot weekend several years ago. While our trip was a comedy of errors worthy of its own movie starring Steve Carrell and TIna Fey, one good thing that came out of it was discovering the simple slaw served at almost every restaurant. Lightly dressed crisp vegetables with a hint of heat continue to be one of my favorites. We first discovered it while enjoying fish tacos while a Mariachi band serenaded us with “Besame Mucho”. 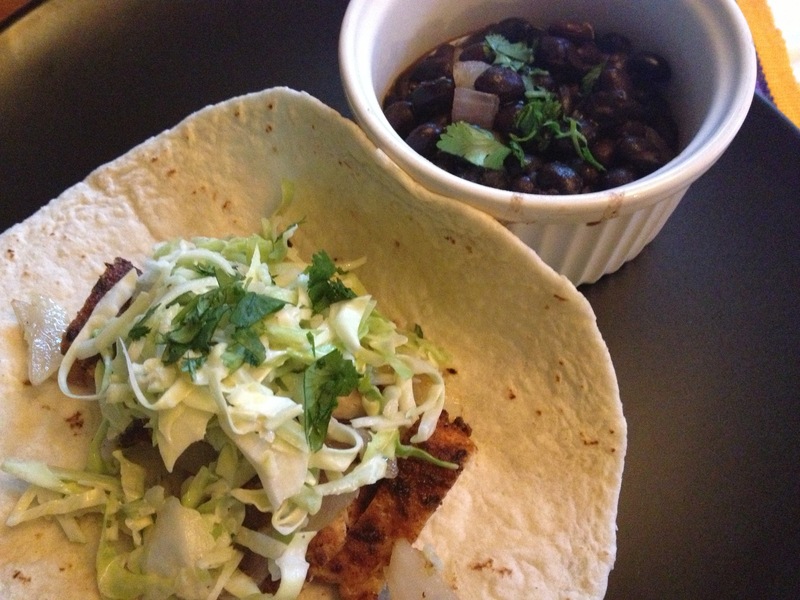 I’ve included a simple fish taco recipe here as well. The recipe is flexible and forgiving. The dressing works well with about 6-8 cups of shredded veggies, and the vegetables can be adjusted based on what is seasonal and on hand. Mix veggies together in a bowl. In separate bowl whisk together mayo, lime juice and tabasco. Toss with veggies and sprinkle to taste with cilantro, salt and pepper. Put in fridge while you prep the fish tacos. Preheat oven to 350˚. Make a spice rub by combining olive oil, paprika, oregano, garlic, cumin, red pepper flakes, lime zest, kosher salt and pepper, then rub it all over the fish. Heat a nonstick pan over high heat until very hot. Dab a little oil in the pan and pan sear the fish, flesh side down until browned. Turn fish to other side, and place in oven and cook until fish reaches an internal temperature of 145˚, about 6-7 minutes. Remove, cover and allow to rest at least 5 minutes. 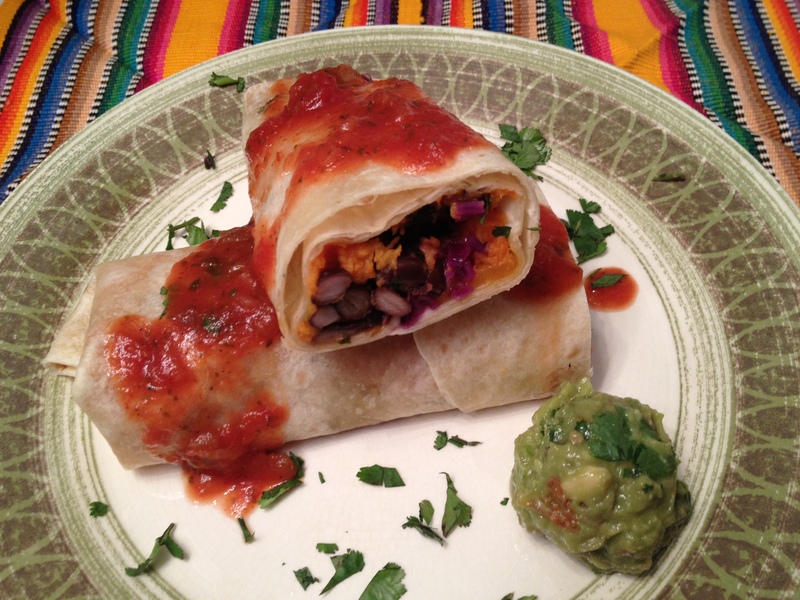 Serve on a tortilla, with a heaping pile of slaw and other condiments of your choice — salsa, guacamole, sour cream etc. The spice rub is inspired by a recipe in Gourmet Magazine from June 2007. Here shortbread gets the GF treatment, with an increase of baking powder and the addition of ground up chia seeds to act as a binder in place of gluten. A word about handling the dough: be light with your hands. 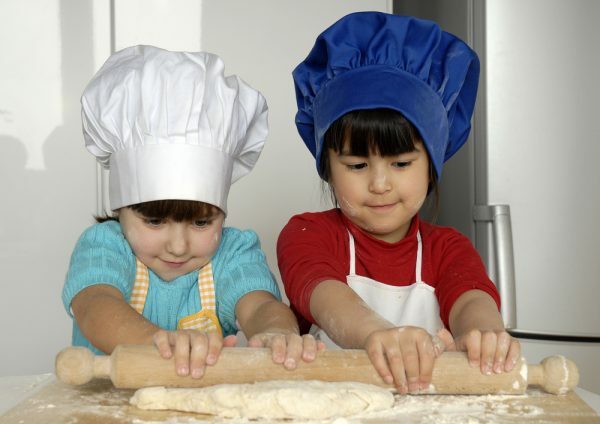 If you pack the dough too tightly, you’ll end up with neither shortcake nor shortbread–but rather short bricks! Combine strawberries and 1/2 cup sugar in a bowl. Allow to rest at room temperature until syrup forms, about 15 minutes. Beat cream, vanilla and 2 tablespoons sugar in a chilled bowl until stiff peaks form. Cover and chill until ready to use. Whisk together flour, lemon zest, ground chia seed, 2 tablespoons sugar, baking powder and salt into large bowl. Add butter pieces and mix with fingers until mixture resembles corn meal. Gradually add 1/2 of buttermilk, tossing with fork until large moist clumps form. Depending on the type of flour you’re using, you might need to add more buttermilk. Add more until you have large, moist clumps that will hold a shape. Gently gather dough into ball, and divide into 8 pieces. Shape each piece into a small patty, but don’t pack the dough too hard. Bake at 375° until toothpick inserted in cake comes out clean, about 20 minutes (shortbread will be pale). 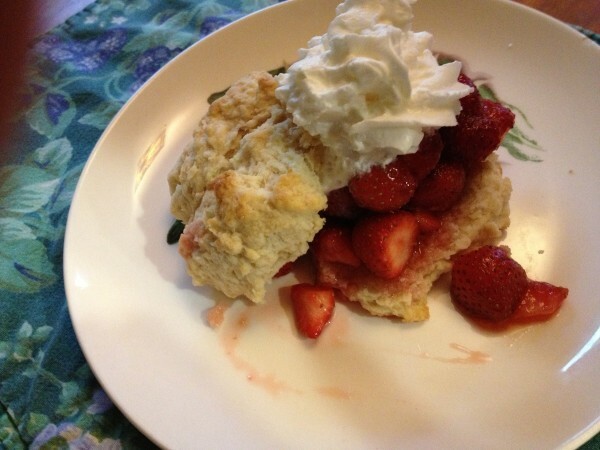 Split each shortbread in half, set on plate, spoon over strawberries and their juice, and garnish with whipped cream. The first weekend in May will see about 80,000 of these being served at Churchill Downs to toast the Kentucky Derby. For me, sipping one marks the rite of passage from winter into spring. It’s light, refreshing, and just like the season itself often is in Wisconsin, super chilly. Grab your muddler and make one today! 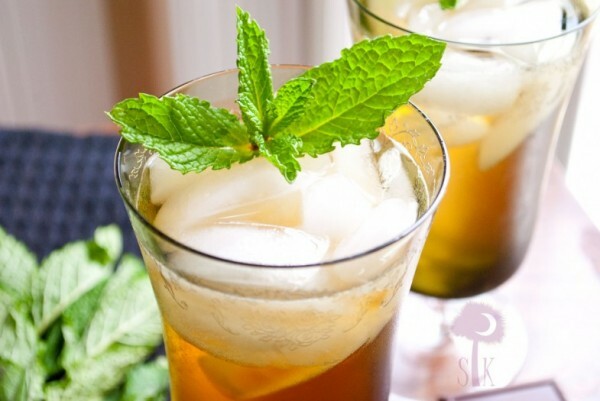 Put sugar and mint in the bottom of a highball or Julep Silver cup and muddle together, gently crushing the mint and sugar together. Fill glass with ice and pour some bourbon over and stir until glass is very frosty. Adapted from Punky Egan’s Parsnip Cake recipe in the cookbook “From Asparagus to Zucchini,” I’ve greatly reduced the amount of sugar in this recipe, and have found the spot where I think the frosting retains the flavor and tang of cream cheese while being pleasantly, though not cloyingly, sweet. 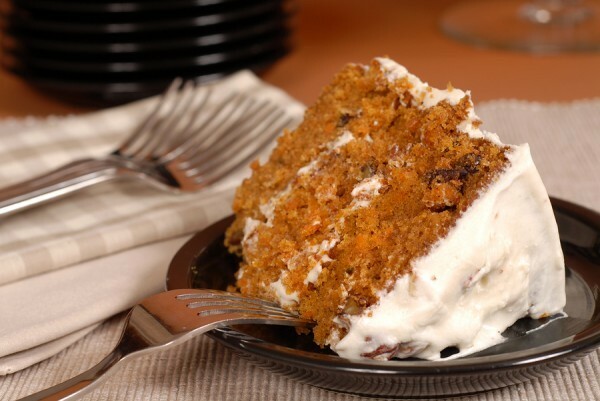 I love a good carrot cake with cream cheese frosting, especially on Easter — don’t you? Preheat oven to 350˚. Stir first 6 ingredients together in a large mixing bowl. Lightly whisk the eggs and canola oil in a medium bowl, fold in shredded carrots, apple and walnuts. Then fold wet ingredients into dry ingredients and mix until just combined. 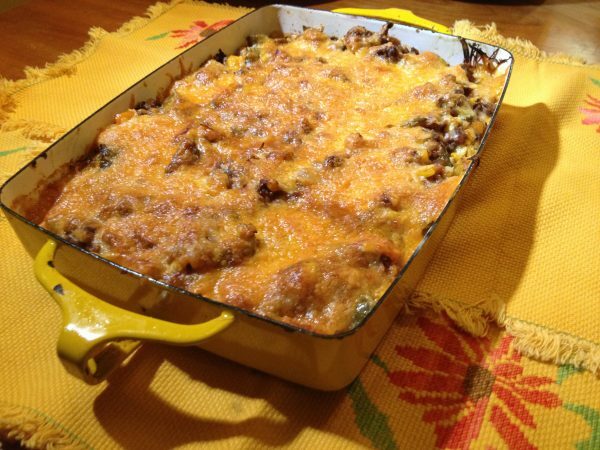 Grease a 9×13 baking dish, and spread batter evenly in pan. Bake for 30-35 minutes, until cake springs back when touched lightly in the center. Cool the cake on a rack for about 15 minutes, then turn out onto a platter. To make the frosting, whip the cream cheese and butter with a mixer to combine, then sift in the powdered sugar and beat until smooth, and beat in the lemon extract. When the cake has cooled entirely, frost the cake.